Hey guys, remember us? We’re the Young Winos of LA, a wine-tasting group for twenty-somethings. Earlier this year, we explained how we were transitioning away from the weekly and/or bi-weekly tastings that used to be our modus operandi, and opting instead for a schedule in which meetings would be a little more infrequent. And we’ve certainly made good on that promise: as of August, we haven’t had any Winos meetings at all in 2013. But that’s about to change when we gather this Wednesday night to taste wines from Sud-Ouest (Southwest) France. 1) We’ve never done it before. After seven years of extremely frequent tastings, there are few major wine topics (i.e. grapes, regions, trends) that haven’t formed the subject of a Young Winos meeting. We’re happy to welcome Sud-Ouest France to that illustrious lineup. 2) It’s a great value. Since our inception, the Winos have always been about seeking out inexpensive bottles that over-deliver on quality. Much of Sud-Ouest France is largely unknown to the casual wine-drinking public, and it’s therefore possible to find really tasty bottles at similarly tasty prices. 3) It’s kind of confusing. To me, this is the most compelling motivator of all. While discovering value bottles is a big part of the Winos ethos, the core essential point of our organization has always been to illuminate wine’s mysteries, to clarify its complexities — to edutoxicate, if you will. And Sud-Ouest France is a region that’s ripe for edutoxication. Why? In a word, its diversity. 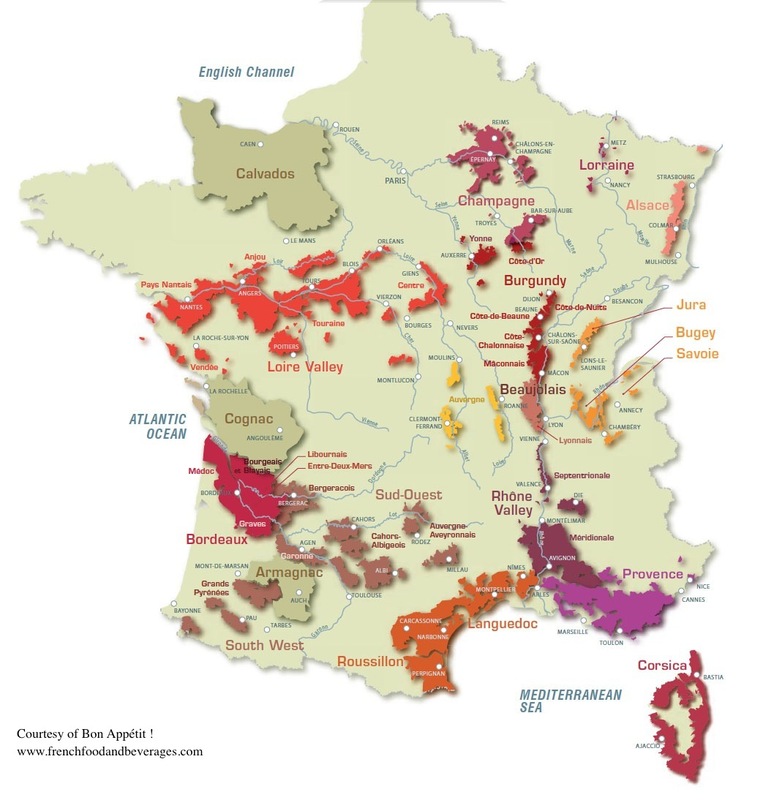 Spread out geographically from the Atlantic coast nearly all the way inland to the Rhône, Sud-Ouest is a disparate sort of catch-all area encompassing a number of small, autonomous regions, each with their own wine culture, history, and grape varieties. And that’s another challenge: unlike its neighbor to the north, Bordeaux, where just a handful of red and white grapes form the basis of all the wines produced there (and all you longtime Winos can name all those grapes, right? …right? ), Sud-Ouest boasts a long list of indigenous varieties, many of them a bit unfamiliar, from Baco Blanc and Colombard to Tannat and Négrette. –Bergerac: immediately adjacent to Bordeaux, Bergerac shares many of its famous neighbor’s winemaking traditions, but puts its own Sud-Ouest spin on things. The whites, for example, feature the traditional Bordeaux grapes Sémillon and Sauvignon Blanc, but may also include Sauvignon Gris, Muscadelle, and Ondenc; while the reds feature the standard Bordeaux recipe of Cabernet, Merlot and Cabernet Franc, but may also boast some Côt or Mérille. 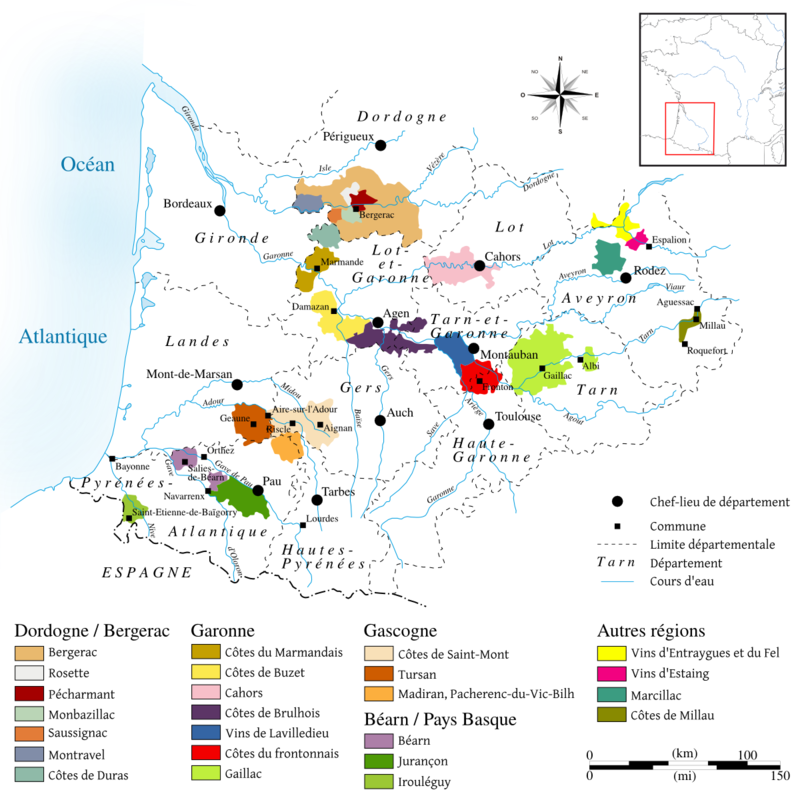 –Côtes de Gascogne: the home of the storied Armagnac brandy, Côtes de Gascogne is also a great source for approachable whites made out of Ugni blanc, Colombard and Gros Manseng. The San Francisco Examiner loves ’em, and I bet we will too. –Cahors: perhaps the most well-known region in Sud-Ouest, Cahors is the home of some of the world’s best Malbec-based wines. Every bottle of Cahors is at least 70% Malbec. We’ll be meeting at Ryan’s place in West LA, and this week’s meeting starts at 8pm. The RSVP system functions like this: if you want in, you click on this link and tell me so (don’t forget your full name, e-mail address, and a cute message conveying to me your intentions), and I’ll send you a confirmation e-mail with the address. Once you’ve received your confirmation e-mail, go find an interesting bottle of wine from the Sud-Ouest of France — or, as always, simply bring ten dollars. Can’t wait to see you ebullient youngsters on Wednesday at 8pm.